A Time of Gifts is everything a travel book should be: brilliantly written, educational, inspiring and full of memorable anecdotes that, once read, appear like ghosts in the reader’s own journeys. It begins with a simple decision. It is December 1933. 18 year old Patrick Leigh Fermor can’t decide what to do with this life, so he decides to go for a walk. Full of the vim of youth, he decides that Constantinople is his destination. Resolved to this gently eccentric trip, Leigh Fermor proceeds to carry it off, armed with a stick, a few possessions and occasional pickups of money from home. As the story progresses his naive charm works a magic spell, turning a trip that promised months of freezing nights in hedgerows into being put up in castles and fine apartments. Leigh Fermor never loses his edge though, and once back on the road returns to the traveller’s life with endless enthusiasm. Two features of A Time of Gifts jump out and linger long in the memory. The first is Leigh Fermor’s prose which is rich and lively. He deserves the title of the greatest living British travel writer. While in part the lucid nature of the writing is due to the author writing – in 1978 – as an older man looking back on an adventure rather than scribbling in the moment, and therefore being able to weave in the astonishing knowledge he possesses, it is also the obvious thrill of discovery and the simple delights of an utterly free life that makes the book special. Once read, I’d defy anyone to not recall the noise of the ice skiff charging along frozen Dutch canals or share the joy of rummaging around a ruined castle on the banks of the Danube, when considering a journey to the areas visited today. The Europe the book describes disappeared forever in 1939, and the lands travelled through in A Time of Gifts feel foreign and distant. That said, it remains a richly rewarding companion on a journey to the continent. There is a sequel, Between the Woods and the Water, which takes the journey from the Hungarian Border to the Danube gorge known as the Iron Gate in what was Yugoslavia. Leigh Fermor did make it to Constantinople fourteen months after leaving Tower Bridge, but that was not the end of the adventure. The author went on to fall in love with Greece and a Romanian noblewoman with whom he lived with in Athens and Moldavia, and serve in the Irish Guards during the Second World War. Later adventures in Greece and the Caribbean, marriage and a life divided between England and Greece followed. There has not yet been a third volume. 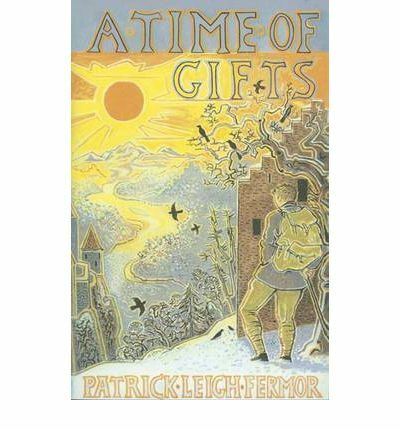 Patrick Leigh Fermor will celebrate his 95th birthday on 11 February. Suggestions for your favourite travel reads are welcome. With what’s left of winter, warm yourself up with A Time of Gifts.